It is not uncommon for our staff conservator to create custom storage containers that are made specifically to the dimensions of an item. However, this is a time-consuming process and is challenging to scale up efficiently. It is also difficult to re-shelve an assortment of non-standardized boxes into the limited space left at the current Vanier Park site. To solve this, our archival custom box supplier used a specialized digital cutter to pre-cut custom boxes in sizes that we have standardized. Many of the oversized bound volumes have a similar ‘footprint’ (or cover boards of the same size) but varying text block thicknesses. We designed our custom boxes according to the size of these ‘footprints’, but with varying depths. This standardization system allows for maximal stacking and optimizes our shelf space. 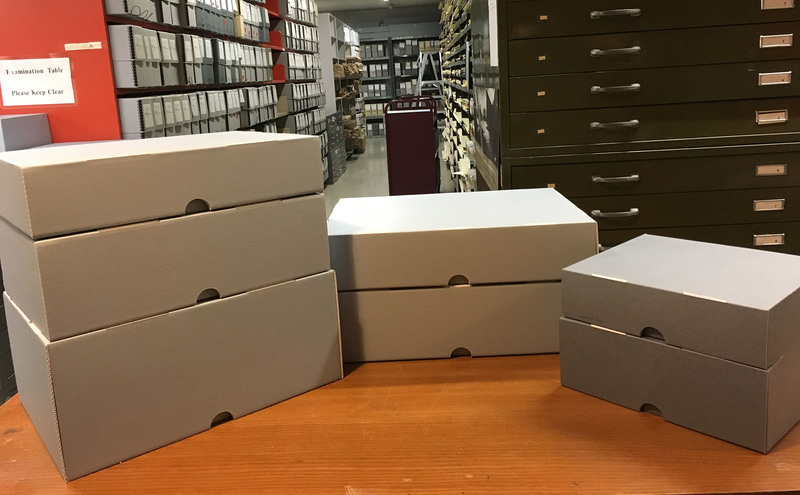 Custom archival containers arranged in groupings with the same ‘footprint’. Photographer: Dorcas Tong. Made with archival materials that are suitable for long-term storage. Provide structural strength to bear the weight of the oversized records. Provide protection for the record during the move. Allow researchers to more easily access the records. After thorough testing, we decided to make our custom containers in the style of clamshell and drop-front boxes using an archival quality corrugated board (i.e. acid-free, lignin-free and alkaline-buffered). Example of custom clamshell and drop-front boxes. Photographer: Dorcas Tong. Detail of custom drop-front box with a Police Court calendar. Photographer: Dorcas Tong. 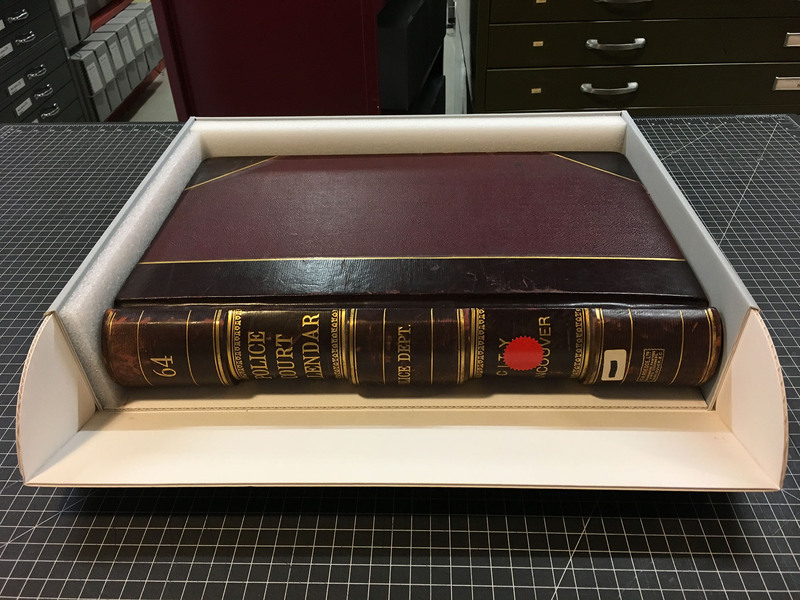 Item identifier: VPD-S182-Police court calendar Vol. 64. Both styles of boxes have double walls on three sides and a cross-laminated panel on the base (and sometimes on the lid) for additional structural rigidity. 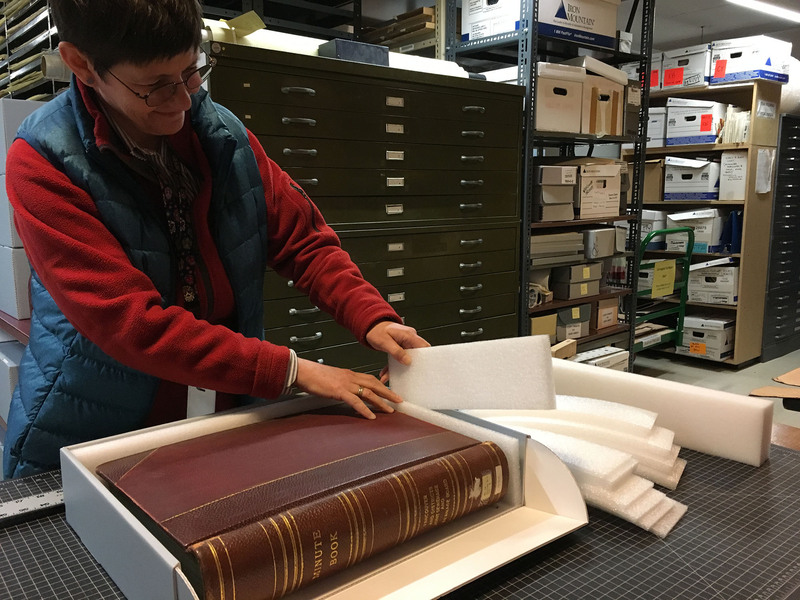 For a small number of bound volumes that are extremely heavy and are as large as the size of our work bench, a specialized archival board with a honeycomb inner structure was used instead for added strength. Detail of the specialized archival board with a honeycomb inner structure as the reinforced base panel. Photographer: Dorcas Tong. We assembled the pre-cut custom boxes and fitted each box with archival quality foam (polyethylene). The foam spacers create a snug fit that prevents the bound volume from sliding around during the move and causing damage. 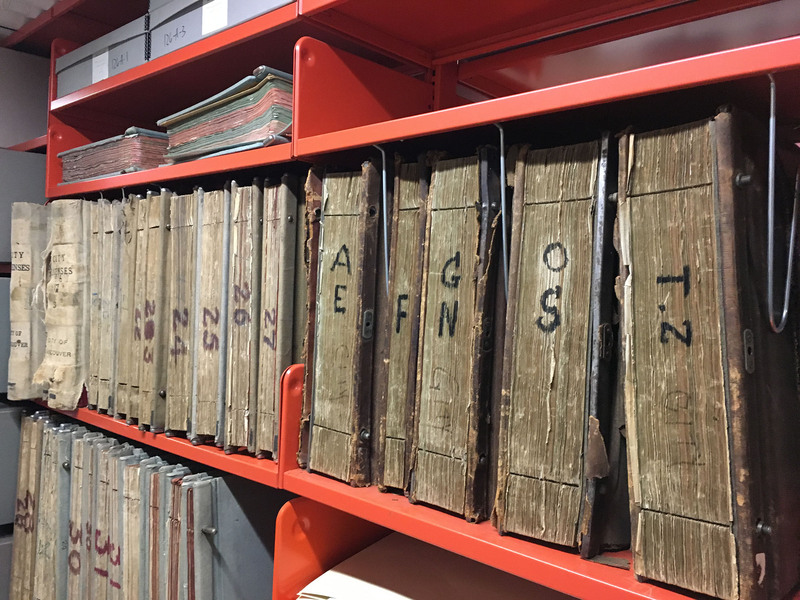 The newly rehoused volume is then properly labelled and reassigned a new location in the vault. 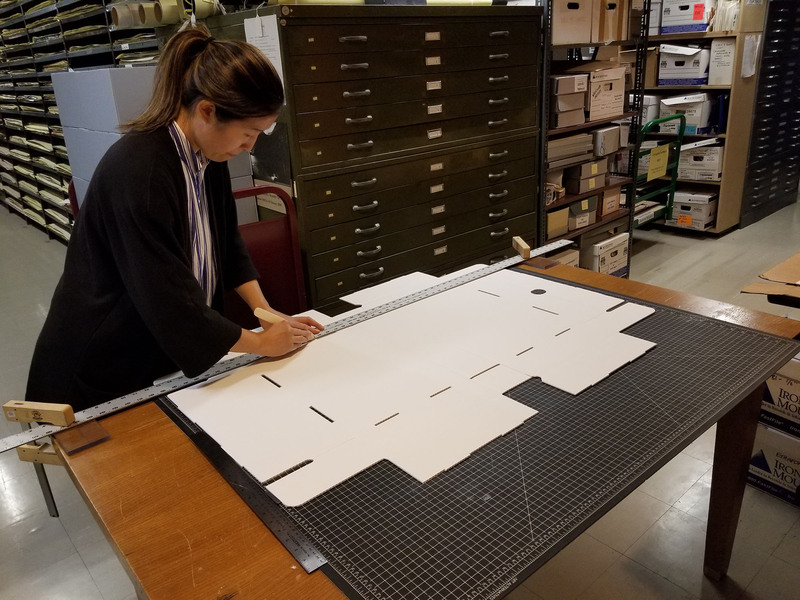 Assembly of pre-cut custom box: project conservator Dorcas Tong scoring the board using a bone folder. Photographer: Paola Merkins. Project conservator Paola Merkins fitting pre-cut foam spacers into a custom container. Photographer: Dorcas Tong. 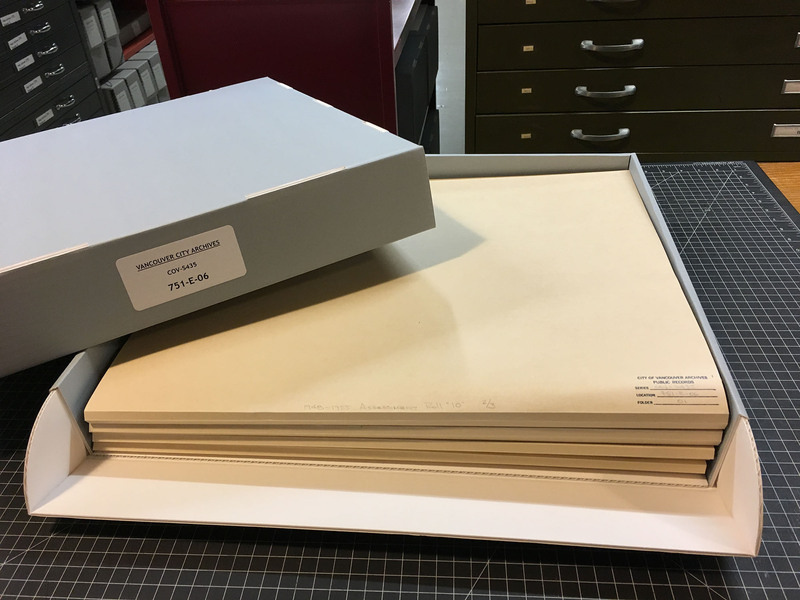 Some oversized volumes can be disbound and filed into folders before housing into a custom container. This makes the textual information more easily accessible to researchers and reduces the risk of damage caused by handling. 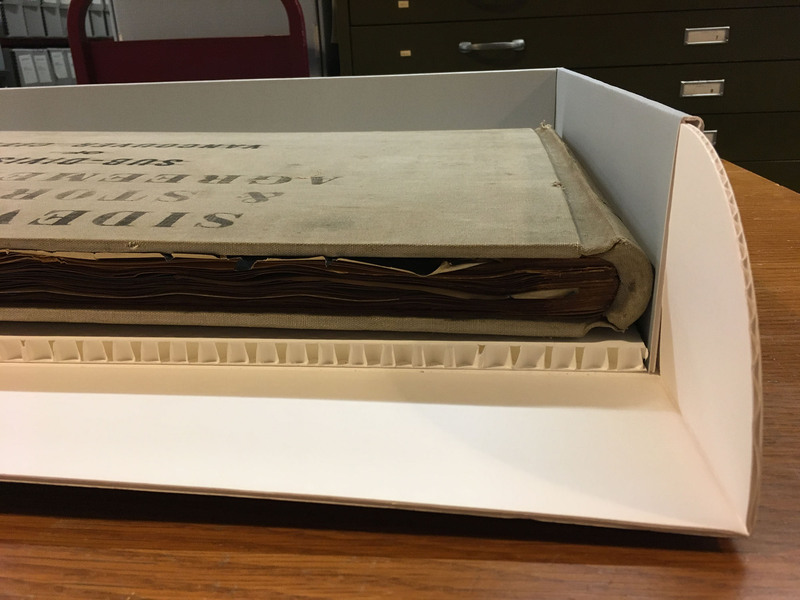 Business license registers are an example of oversized bound volumes with post-binding structure that are difficult to retrieve and access. Photographer: Dorcas Tong. Series identifier: COV-S383. Example of a post-binding volume after disbinding: the pages of the text block are filed in file folders. Photographer: Dorcas Tong. 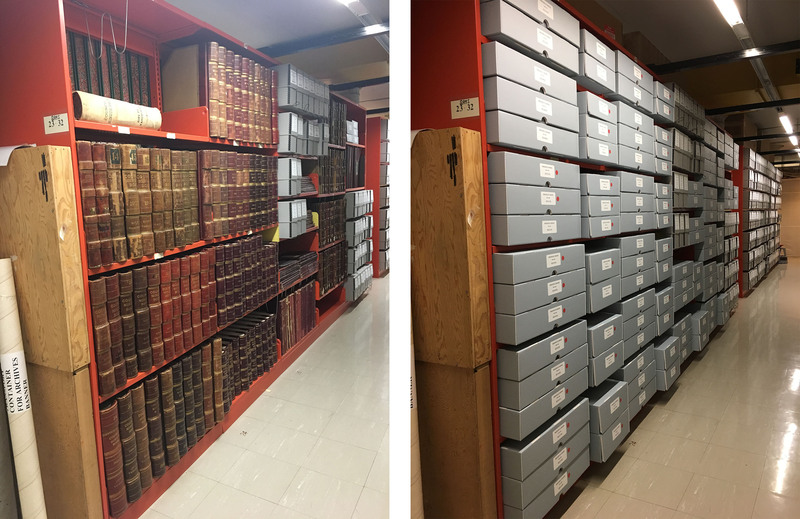 The process of rehousing oversized bound volumes is well underway and we will keep you updated as the conservation team tackles other challenges in the Pre-move project. This entry was posted in Holdings, Preservation and tagged boxes. Bookmark the permalink.